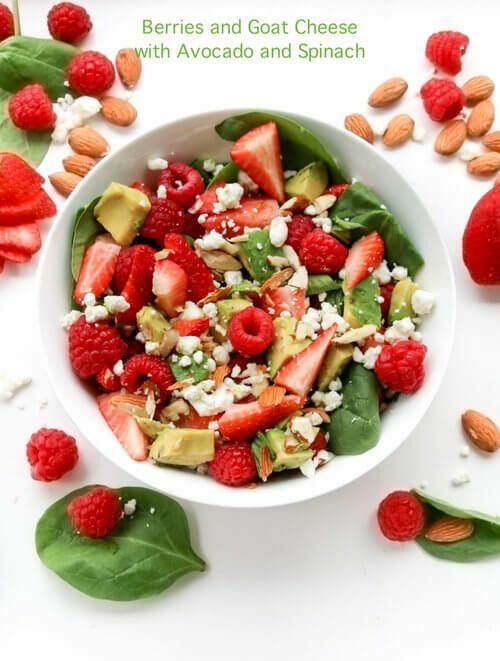 Berries and goat cheese with avocado and spinach salad will help you prepare for the warmer weather, just couple months to go! Tip: Make sure to use raw almonds, because roasted almonds lose the nutrition and health benefits during roasting. Almonds contain the most fiber than other nuts and is beneficial to your gut. As for berries, they are loaded with antioxidants. Eating them helps burn fat and boost your mood! If you're a fan of goat cheese, don't skip out on it in this recipe! It contains a lot of calcium and prevents sugar cravings. Slice 1 cup of strawberries. Add to a bowl with 1 cup raspberries and 1 cup spinach leaves. Slice or chop 1 Tablespoon raw almonds and add to the bowl. Dice 1 ripe avocado mix in with the rest of the ingredients. Sprinkle 1/4 cup goat cheese. Dressing: Drizzle 2 Tablespoons of balsamic vinegar.